Troopers asked drivers to "put down your sandwiches, like we saw here today, and put down your phones and be looking through your windshield while you're driving." Indiana police say that distracted driving caused by eating resulted in a two semi truck crash that claimed a woman’s life over the weekend. 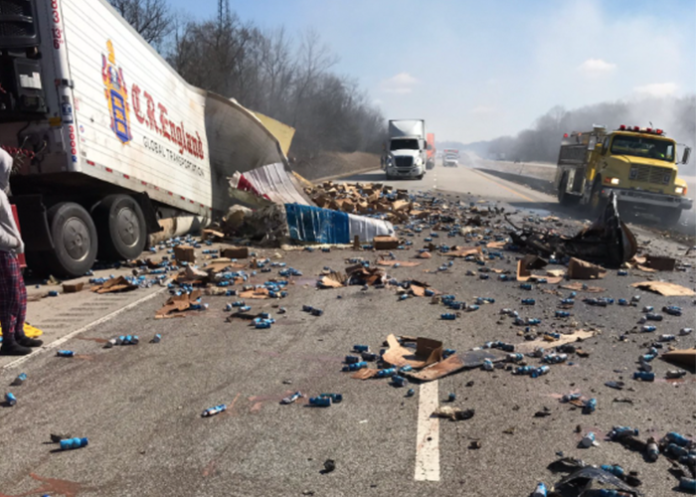 The crash happened just before noon on Saturday, March 16, on I-70 in Clay County, Indiana, according to a news release from the Indiana State Police. Troopers say that 49 year old truck driver Joe L. Robinson Jr. was traveling westbound on I-70 near mile marker 17 when he came upon traffic that had slowed for a previous crash. Robinson stated that he had dropped his sandwich and had leaned over to pick it up, taking his eyes off the roadway. He stated that once he looked back to the road, he immediately observed slowed or stopped traffic in front of him. Robinson stated that he attempted to avoid a collision with another semi tractor-trailer by steering hard to the left. Being unable to avoid a collision, Robinson then struck a 2018 Freightliner semi tractor-trailer clipping the rear and causing its fuel tank to burst into flames. Robinson’s tractor-trailer continued to travel towards the south side of Interstate 70, eventually going into the median and coming to a stop. The 2018 Freightliner struck by Robinson was driven by Michael A. Workman, 30, of Glendale, Arizona. Forty-five year old April L. Robinson, who was in the sleeper berth area of Joe Robinson’s truck, died at the scene. Fifty-two year old Charles T. Tolbert was taken to the hospital for treatment of non life-threatning injuries. Tolbert was a passenger who was in the sleeper berth of Workman’s truck at the time of the crash. Another serious accident at the 17 mm of I-70 WB. Neither truck driver was hurt. “All we ask people to do is put down your sandwiches, like we saw here today, and put down your phones and be looking through your windshield while you’re driving,” said Indiana State Police Sgt. Matt Ames. Police say that the incident remains under investigation.